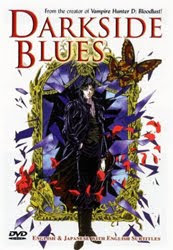 The Anime Archivist: Video Backlog: "Darkside Blues"
Story Outline: Sometime in the future, almost the entire planet is owned by the private corporation Persona Century. Only a few free areas remain on the planet. One of them is Kabuki-cho in modern day Shinjuku. Here is where the rebel force named Messiah is most concentrated. Because of this, the run down city is considered to be the dark side of Tokyo. Despite the Persona Century corporation cracking down hard on Messiah, they continue to survive. Add into the mix a young boy Kitari who seems to have sort of power around him. Life in the city is changed when a mysterious man who calls himself Darkside comes from space in horse drawn carriage, seemingly to protect the citizens of the town. Mini Review: What a strange movie this is. The problem I had with it is that it seems to have no form. We can see that those running Persona Century are bastards, but the motley group of freedom fighters just seem so disorganised. Add in the weirdness and supernatural elements with Darkside, Kitari and an old lady and her cat at what seems to be a magical hotel where people go to ask for help or advice. It just seems rather loose and didn’t go anywhere. Characters seemed to be focused on for no reason other than they were there. All rather strange and unfocused for me. Though this show looks like a Madhouse production with Yoshiaki Kawajiri at the helm, it’s not. It’s a J.C. Staff show based upon a Hideyuki Kikuchi (Vampire Hunter D, Demon City Shinjuku) manga. The show looks great, but it just didn’t make a whole lot of sense. 5 out of 10.